A sultry July evening is the perfect time to take advantage of all the blooms in your garden and host a dinner party with a Romantic Flower-themed Summer Tablescape. Of course, I don’t need and excuse to celebrate all things floral. If you follow me on Pinterest, you know that I am a bit pin-crazy when it comes to floral arrangements. Okay, I know it’s a problem, and I’m working on it (not). However, since my 28th anniversary is coming up, I have the perfect reason to throw a party. The inspiration for this table was a floral wreath that I found at one of my favorite stores, Black Lion. In addition to an online store, Black Lion is a huge brick and mortar home furnishings, gift and design marketplace in Charlotte, NC. It contains dozens of visually stunning booths that are leased by individual merchants. It’s one of those places I tell myself I will go to, just to browse and get design ideas, but I am weak, and I never manage to leave the store without purchasing something. 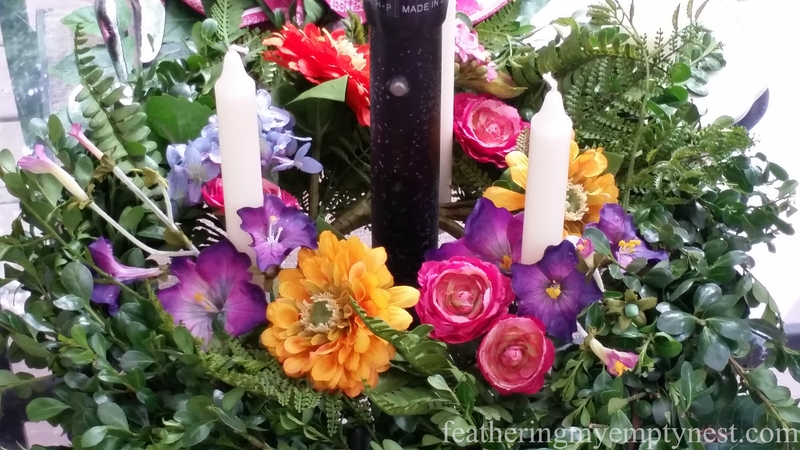 I’m not usually in favor of faux flowers, but the flowers on this wreath were so life-like and vibrant that I couldn’t resist it. I always find decorating my umbrella table to be problematic because, once you put down the place settings, there isn’t much space left on the table. And the center of the table, where you would naturally put a flower arrangement, has a great big old pole in the way. 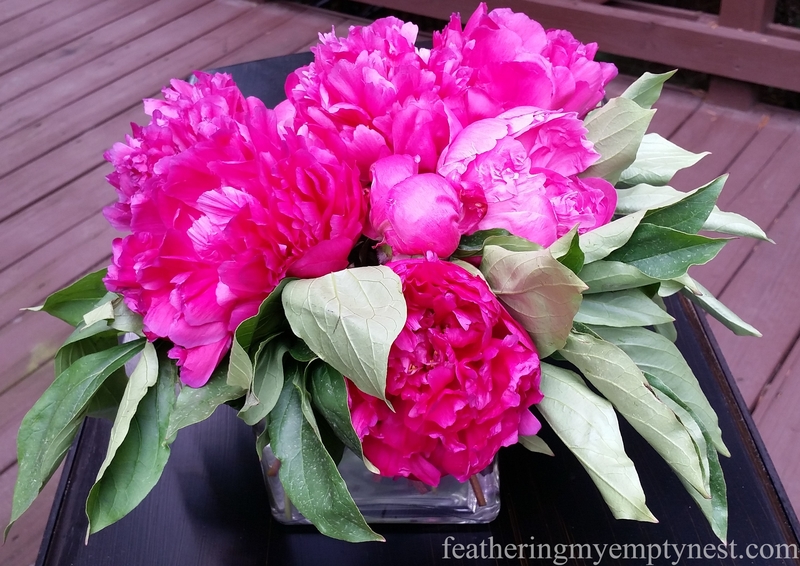 This is why, when I clapped my eyes on this wreath, I knew it would make a great centerpiece to encircle the umbrella on my outdoor table. However, the floral garland did not have enough presence to stand alone. 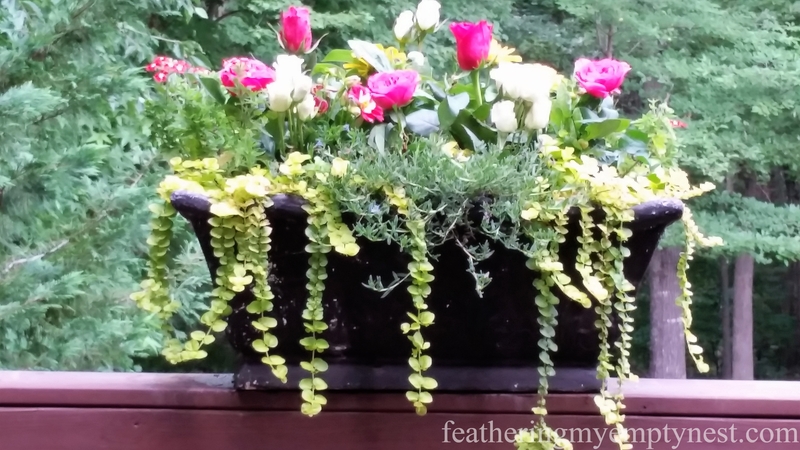 To remedy this, I decided to frame the blooms with greenery. I accomplished this by cutting sprigs from my boxwood bushes and inserting them into a large grapevine wreath. To continue with the boxwood greenery and add some height and drama to my table, I added two preserved boxwood topiaries. 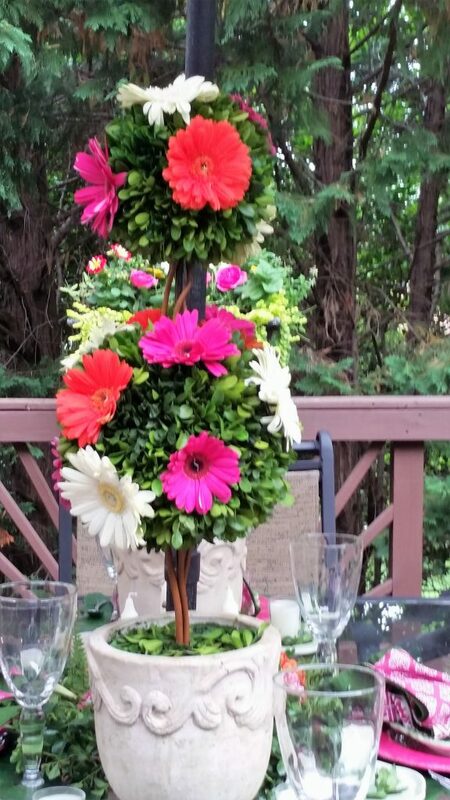 Wanting to include some fresh flowers and to bring the bright color of the floral wreath up to the topiaries, I used floral pins to attach cut white, pink, and orange gerbera daisies to the boxwood spheres. 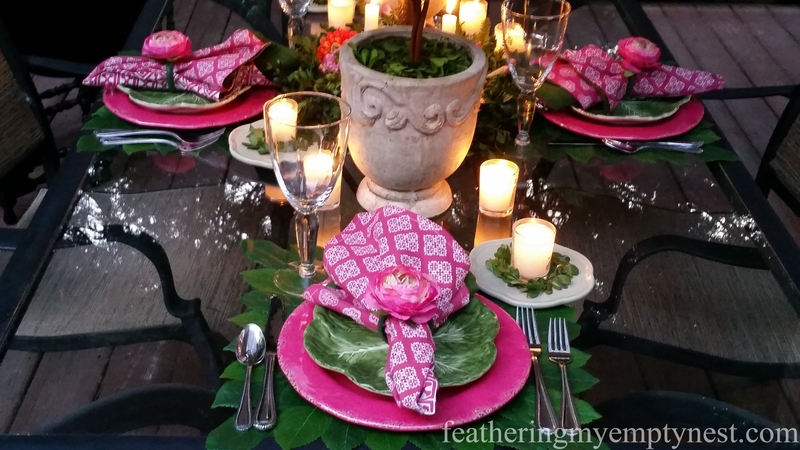 For the place settings, I began with my trusty square lemon leaf placemats. (I bought them before Christmas and I have used them dozens of times since then.) 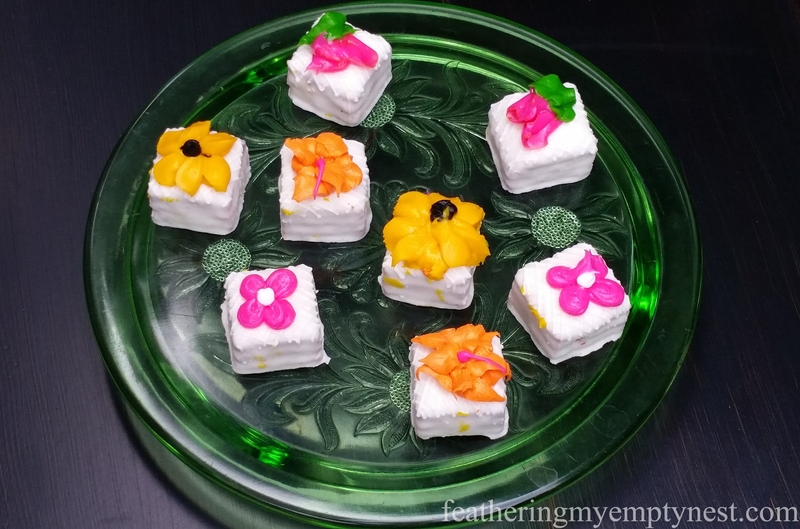 They are particularly suited to my Flower-themed Summer Tablescape because they add greenery, but more than that, they are smaller than standard rectangular placemats and take up less space on my compact outdoor table. 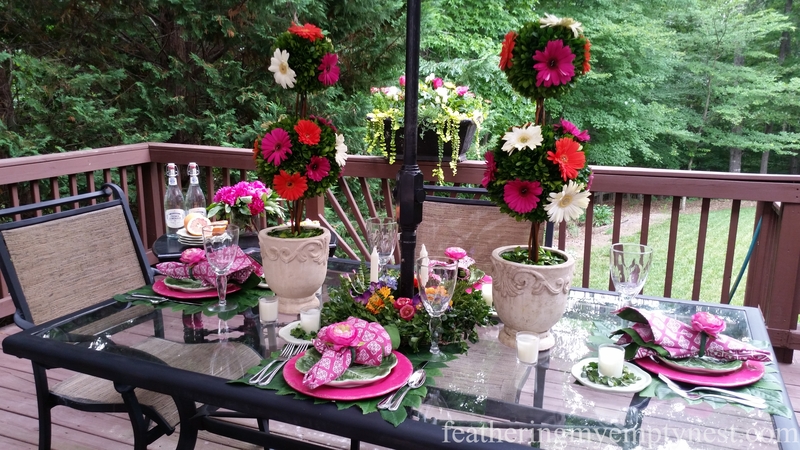 The dinner plate is bright pink to match the flowers and designed to look like handmade stoneware but is actually made of outdoor-safe melamine. These plates were all over the place this season, and I couldn’t resist buying some. Compared to stoneware, they are inexpensive and, unlike so many other melamine plates, you cannot tell by looking at them that they are plastic. 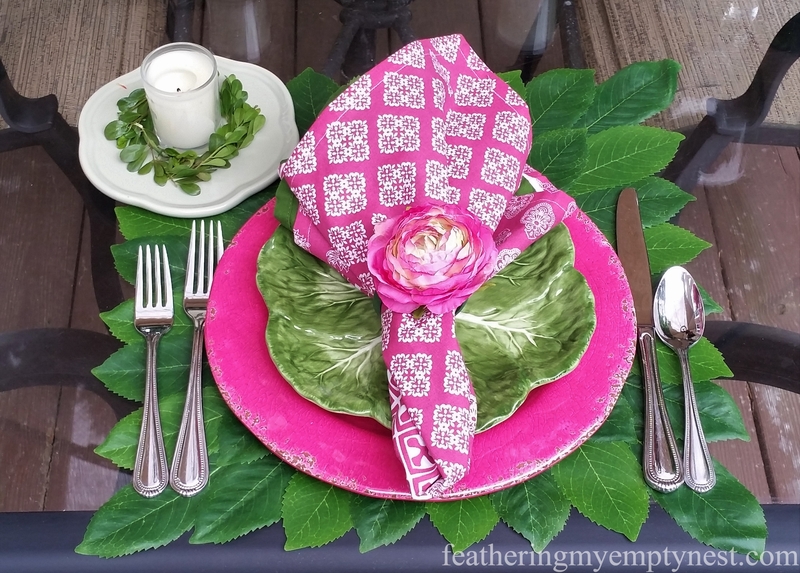 Alternating the pink and green color scheme, I placed cabbage leaf salad plates and pink patterned cotton napkins (no longer available online) from World Market on top of the dinner plates. I wanted to continue the flower theme with flower napkin rings. Pier One had ranunculus napkin rings in early spring, that I loved, but they were too pricey for me. So, I made my own “knock-off” flower napkin rings by wrapping green floral tape around inexpensive plastic shower curtain rings and hot gluing faux ranunculus flowers to them. To complete the table setting and add the romance of candlelight, I added a small sage green flower shaped saucer topped with a fresh boxwood wreathed votive candle to each place. Since my table is small and my decorations tend to take up most of the available space, I need a rolling cart to serve the food. I have been on the lookout for a long time for the perfect server or bar cart, but I still haven’t found an inexpensive one that I like. Nevertheless, I need a place to put the food for my dinner party. To solve this dilemma, I moved my small drop leaf table out to the deck. It works well because, although it doesn’t have the movability of a wheeled cart, it does have the expandability of the drop leaves. And of course, I needed the leaves because I couldn’t help using some of the room on the cart for more flowers. 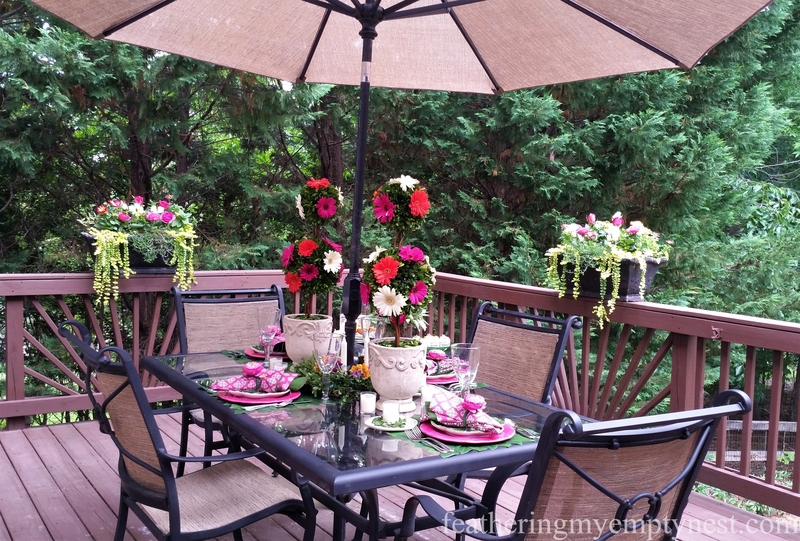 Speaking of more flowers, The flower boxes on my deck railings provide a floral backdrop to my table but the red and yellow flowers did not coordinate with my color scheme. Because I am a nut and maybe a bit OCD, I decided to insert pink and white cut flowers into the boxes so they would harmonize with the tablescape. Candlelight adds the final romantic element to the Romantic Flower-themed Summer Tablescape. 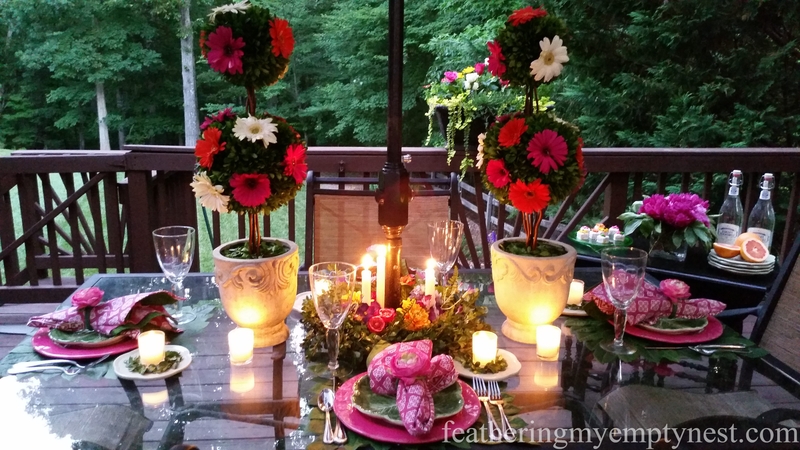 When night began to fall, and I lit the candles, my Romantic Flower-themed Summer Tablescape felt so romantic that I decided to remove two of the place settings, uninvite our kids, and just have an intimate dinner for two with my sweetheart. I’ll make it up to the kids another time. 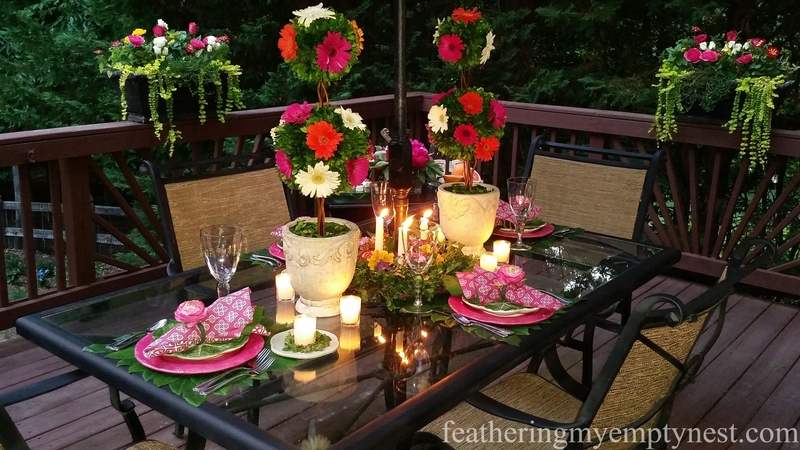 I love your summer table decorations and the evening picture is so welcoming. Eating al fresco is one of my favorite things. This is definitely something I’m going to try! Thank you. Hopefully, it will cool down a bit because right now it feels too hot to eat outside. Thanks, Mimi. I really appreciate your comment. 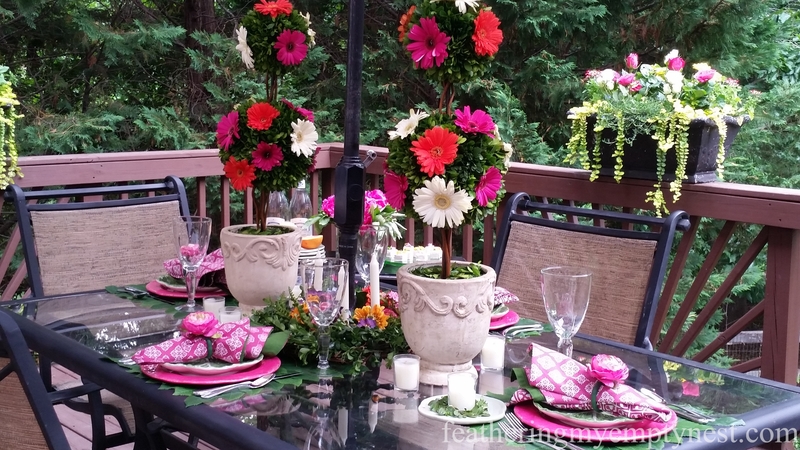 Your guests will certainly enjoy this pretty setting. Flowers real or faux always add the extra beauty. Thanks for the tip on decorating tables with umbrellas – I’ve never been happy with what I tried for mine. Thank you so much for your kind words. 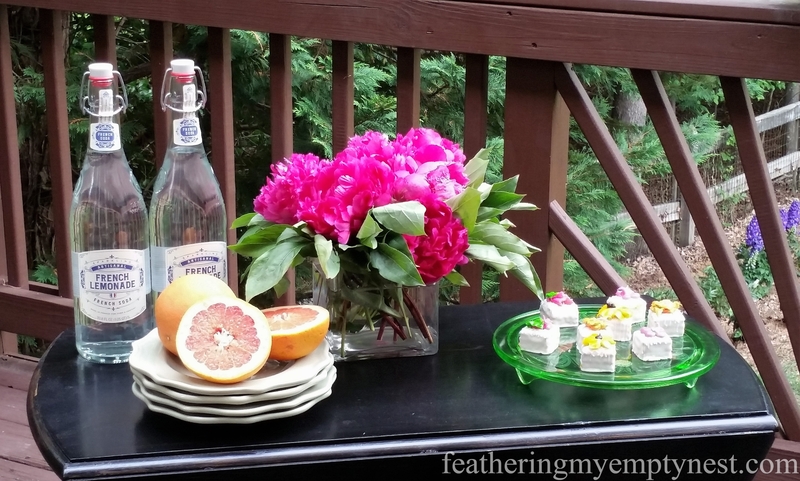 I really appreciate you taking the time to comment on my summer flower tablescape post. 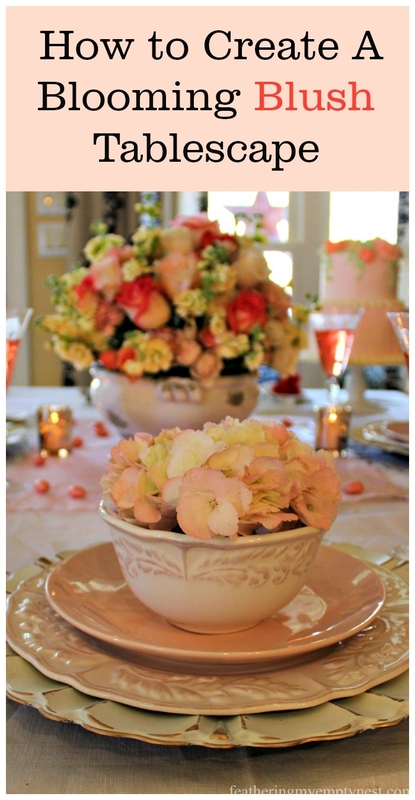 Those topiaries bring such a lush quality to the the tablescape! 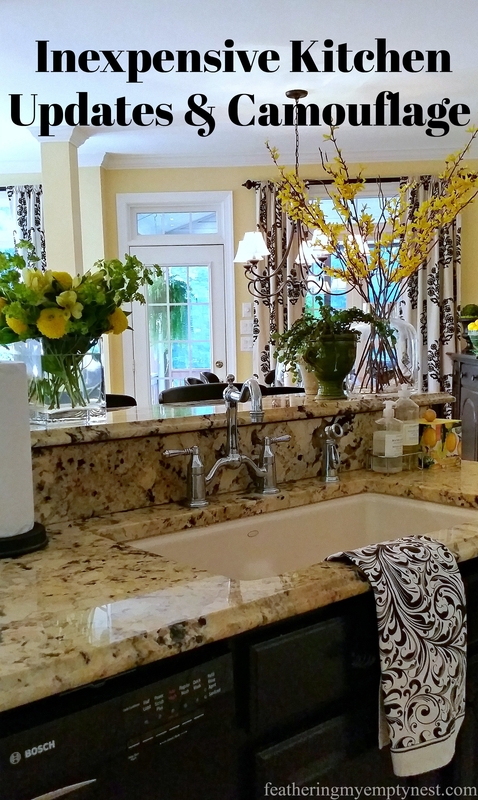 I have a preserved topiary in my dining room that I love–but it lacks presence amid the dark tones of my decor. I am going to try adding fresh flowers for a special occasion. Thanks so much for taking the time to comment. I was worried that attaching the fresh flowers to my topiaries with floral pins would damage the foliage but when I removed them, the preserved boxwood was just fine. What a pretty casual and elegant table. Your styling and pictures are fantastic! 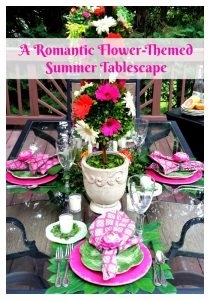 Thank you so much for your kind comment about my summer flower tablescape. I very much appreciate it. Thank you for your comment and your good wishes. 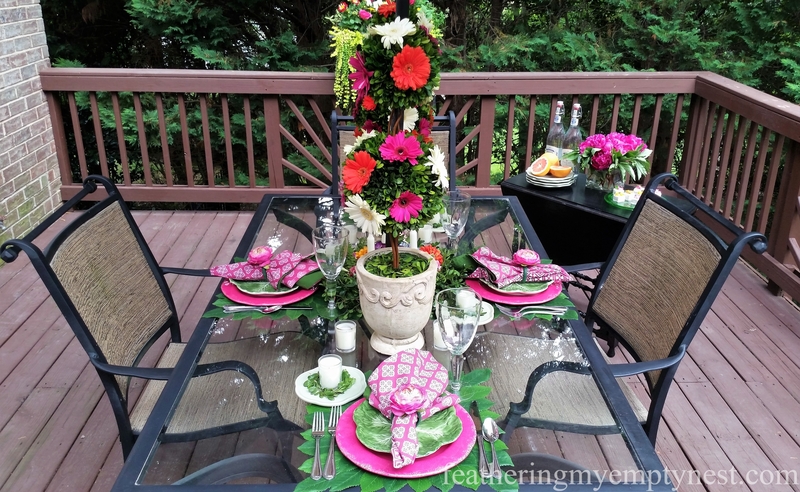 What a really fun and colorful table setting!!! So festive fr guests!! Thank you for stopping by Oh My Heartsie Girls Friday Features Linky party this week!! Thanks, Karen and thanks for hosting. Happy Anniversary to you too and thank you for taking the time to visit my blog and comment. I love your blog and your sense of style! You give each touch your own personality – that’s what makes your place setting so inviting. And I love how you decided to “ditch the kids” at the last minute! Thanks so much for your kind comment about my post. I really appreciate it.